I have several shows coming up soon. 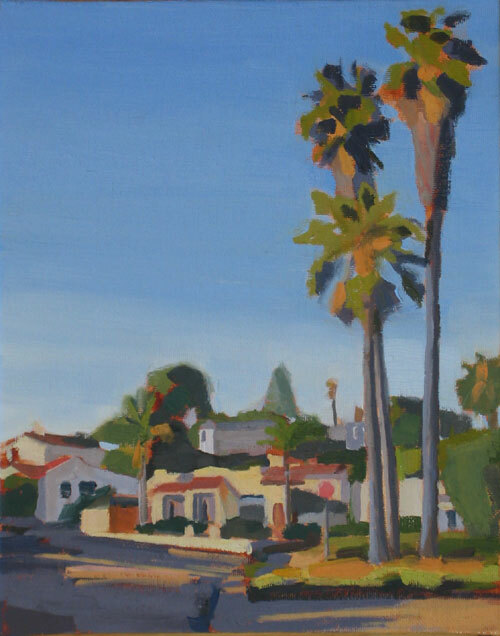 In April, I will be part of a group show called "City Streets" at Studio Gallery in San Francisco. 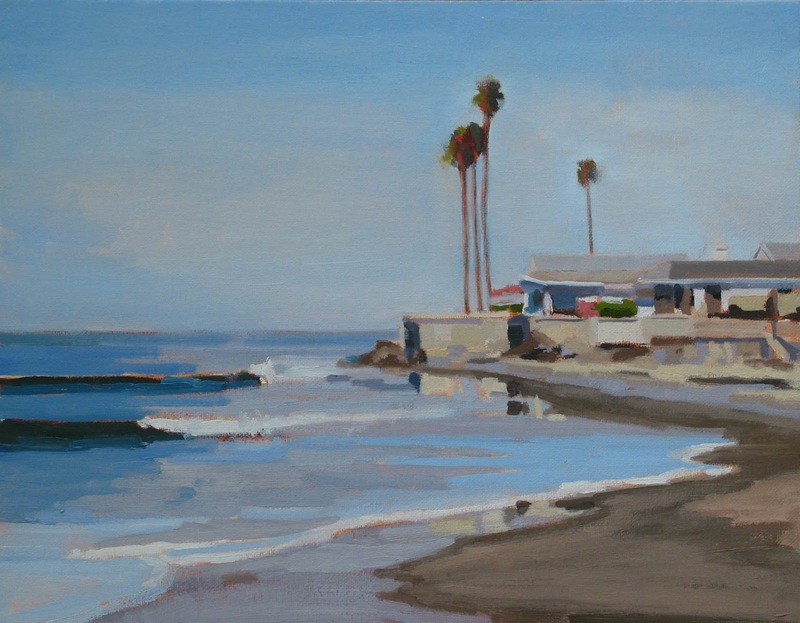 This summer I'm in a show in Ventura called "Staycation" and Friday my Santa Cruz paintings will be hanging at the Plantation Cafe in Menlo Park. Check my website for details. 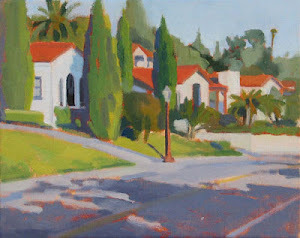 The painting above shows a street scene in Ventura, looking north on Live Oak Drive at the corner of Poli Street. The focal point of the composition is a 1920s spanish style house that has two bronze monkeys on either side of the front entry. Although you can't see the bronze monkeys in the painting, I believe they were original to the house and they're pretty cool. The palm trees on the right side add a nice vertical element to the composition. Like a lot of people who did not grow up in California, I am always fascinated by palm trees. I'm trying to push my colors and values a little bit. Sunset is the perfect time to see the biggest difference in values, so I'm trying to convey the warmth of the light with some pinks and oranges in the street and the darkness of the shadows with a mixture of ultramarine blue and cadmium red light. 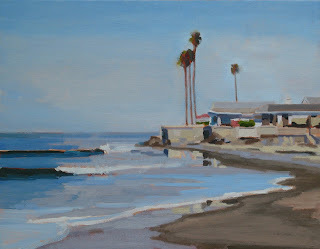 We had some beautiful warm days last week, which made me think of the beach in California. The painting above is Faria Beach in Ventura. It shows the beach in the fall, at low tide with small waves. The surf spot is called Mondos and it's a VERY popular surf spot for beginners. Craig and I use to tandem surf at Mondos about fifteen years ago. It was so much fun. Although painting the ocean can be a study in blue, there are beautiful color variations in the sand and the water. From a purplish color in the wet areas of the sand to warmer orange-brown tones in the totally dry sand. Where the waves have formed, you can see a combination of ultramarine blue, viridian green and transparent red oxide. The blue color in the wave is the reflection from the sky, the viridian is the color of the cast shadow under the lip of the wave and the transparent red oxide is the sand that is churned up in the water. There are a lot of subtle colors and reflections from the sky and buildings on the water that create an interesting challenge for a painting. 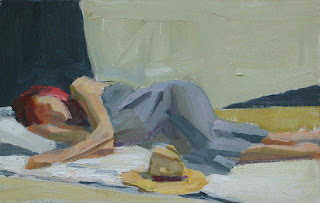 I just finished a three-day figure painting workshop with Peggi Kroll Roberts. Peggi is an excellent teacher with a vast knowledge of figure painting. It's kind of like boot camp for figure painting. She has many different exercises to get you started. 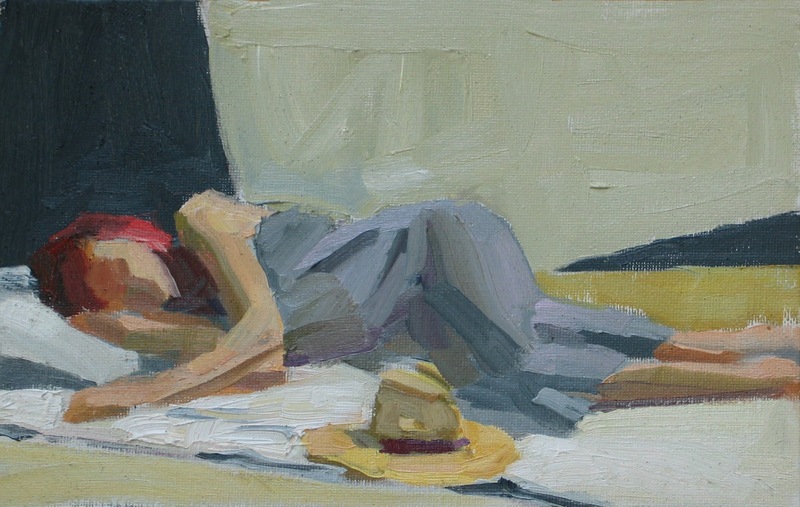 My favorite exercise was painting the figure in 25 strokes. This may seem very difficult, and it was, but you can paint the whole background in one stroke if you load up your paintbrush with lots of paint and don't lift the paintbrush until the entire background is covered. That was just one of the many exercises. I can still hear her saying "there are two kinds of shadows that occur when light shines on an object, form shadows and cast shadows. Where the light side of the object meets the form shadow is the core shadow. The core shadow is where the object turns away from the light." Take a look at Peggi's website to see her work. I highly recommend her figure painting workshop.